Such language is found elsewhere in scripture. Genesis speaks of “brimstone and fire” raining down on Sodom and Gomorrah (Genesis 19:24; cf. Luke 17:29), while another text warns of God sending “fire and brimstone” upon the wicked (Psalm 11:6). In the New Testament the book of Revelation (which draws heavily on apocalyptic language from the Old Testament) uses “fire and brimstone” (14:10; 21:8) and “lake of fire and brimstone” (19:20; 20:10) to depict the torment of Satan and his followers. Although the Book of Mormon renders this phraseology in familiar King James English,3 the text's core teachings and underlying depictions accurately reflect very ancient Near Eastern perceptions and pre-Christian precedents. Dennis L. Largey, “Hell, Second Death, Lake of Fire and Brimstone, and Outer Darkness,” in The Book of Mormon and the Message of the Four Gospels, ed. Ray L. Huntington and Terry B. Ball (Provo, UT: Religious Studies Center, Brigham Young University, 2001), 77–89. Larry E. Dahl, “The Concept of Hell,” in A Book of Mormon Treasury: Gospel Insights from General Authorities and Religious Educators, (Provo, UT: Religious Studies Center, Brigham Young University, 2003), 262–79. Monte S. Nyman, “The State of the Soul between Death and Resurrection,” in The Book of Mormon: Alma, the Testimony of the Word, ed. Monte S. Nyman and Charles D. Tate Jr. (Provo, UT: Religious Studies Center, Brigham Young University, 1992), 173–94. 1. 2 Nephi 9:16; cf. vv. 19, 26; Jacob 3:11; 6:10. 2. For an overview of this teaching in the Book of Mormon, see Dennis L. Largey, “Hell, Second Death, Lake of Fire and Brimstone, and Outer Darkness,” in The Book of Mormon and the Message of the Four Gospels, ed. Ray L. Huntington and Terry B. Ball (Provo, UT: Religious Studies Center, Brigham Young University, 2001), 77–89. 3. The similar scenes described in the book of Revelation and in Nephi’s writings may well be attributable to Nephi having seen the things which the apostle of the Lamb and other ancient seers would also be shown (1 Nephi 14:24, 26). For a discussion see Brant A. Gardner, The Gift and Power: Translating the Book of Mormon (Salt Lake City, UT: Greg Kofford Books, 2011), 307–308. 4. Ludwig Koehler and Walter Baumgartner, The Hebrew and Aramaic Lexicon of the Old Testament (Leiden: Brill, 2001), 2:1781. 5. See the commentary in Philip C. Schmitz, “Topheth,” in The Anchor Bible Dictionary, ed. David Noel Freedman (New York: Doubleday, 1992), 6:601. Note also the observation made by Joseph Blenkinsopp, who writes that this passage “concludes with the ritual immolation [burning] of Assyria in the Valley of Hinnom, later Gehenna.” Joseph Blenkinsopp, Isaiah 1–39, The Anchor Bible (New York: Doubleday, 2000), 424. 6. Koehler and Baumgartner, The Hebrew and Aramaic Lexicon of the Old Testament, 1:351. 7. Matthew 5:22, 29–30; 10:28; 18:9; Mark 9:43, 45, 45; Luke 12:5; James 3:6. 8. See Duane F. Watson, “Hinnom Valley,” in The Anchor Bible Dictionary, 3:202–203. Biblical scholars dispute to what degree these passages describe actual, historical human sacrifices as opposed to act as polemical rhetoric against unpopular Judahite kings such as Ahaz and Manasseh. See the recent discussions presented in Francesca Stavrakopoulou, King Manasseh and Child Sacrifice: Biblical Distortions of Historical Realities (Berlin: de Gruyter, 2012); Heath D. Dewrell, Child Sacrifice in Ancient Israel (Winona Lake, IN: Eisenbrauns, 2017). Whatever the case may be, the recognition of the Valley of Hinnom as a place of fiery death and destruction in Israelite religious consciousness is attested in texts contemporaneous to Lehi and Nephi (Jeremiah 7:31–32; 19:2–6, 11–14; 32:35). 9. Ancient Egyptian beliefs about the afterlife spanned millennia. The earliest corpus of texts describing how the Egyptians conceived of the afterlife are the Pyramid Texts of the Old Kingdom (ca. 2705–2180 BC), followed by the Coffin Texts of the Middle Kingdom (ca. 1987–1640 BC), followed by the Book of the Dead, the Book of Gates, the Book of Caverns, the Book of the Amduat, and other similar compositions in the New Kingdom (ca. 1540–1075 BC), and the Book of Breathings in the Ptolemaic Period (ca. 350–30 BC). During Egypt’s history some beliefs and traditions about the nature of the afterlife diminished over time while others remained popular, with elements from the Pyramid Texts or the Coffin Texts sometimes surviving many centuries past their initial composition and resurfacing in texts from the New Kingdom, such as the Book of the Dead. 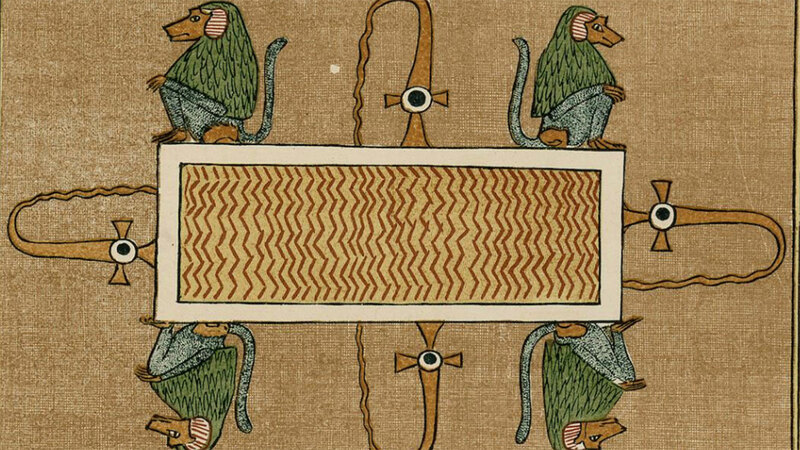 For an accessible overview of these texts, their transmission, and their significance in ancient Egyptian religion, see Erik Hornung, The Ancient Egyptian Books of the Afterlife, trans. David Lorton (Ithaca, NY: Cornell University Press, 1999). 10. See the extended discussions with ample textual citations and examples in J. Zandee, Death as an Enemy According to Ancient Egyptian Conceptions (Leiden: Brill, 1960); Erik Hornung, Altägyptische Höllenvorstellungen (Berlin: Akademie Verlag, 1968); “Black Holes Viewed from Within: Hell in Ancient Egyptian Thought,” Diogenes 165, no. 42/1 (Spring 1994): 133–156. 11. So translated routinely by Egyptologists, including Hornung, Altägyptische Höllenvorstellungen, 22. 13. Hornung, “Black Holes Viewed from Within,” 142. See also the discussion in Eltayeb Sayed Abbas, The Lake of Knives and the Lake of Fire: Studies in the Topography of Passage in Ancient Egyptian Religious Literature, BAR International Series 2144 (Oxford: Archaeopress, 2010). Spell 149 from the Book of the Dead contains this description of the lake of fire: “Its water is fire, its waves are fire, its breath is efficient for burning, in order that no-one may drink its waters to quench their thirst, that being what is in them, because their fear is so great and so towering is its majesty. Gods and spirits see its water from afar, but they cannot quench their thirst and their desires are unsatisfied.” Raymond O. Faulkner, The Ancient Egyptian Book of the Dead: 189 Spells, Prayers and Incantations for the Afterlife (Cairo: The American University in Cairo Press, 2010), 144. 14. Hornung, “Black Holes Viewed from Within,” 145. Compare this with the teaching of Book of Mormon prophets that a “second death” (also called a “spiritual death” and an “everlasting death”) awaits unrepentant sinners (Jacob 3:11; Alma 12:16, 32; 13:30; Helaman 14:18–20). 15. See Zandee, Death as an Enemy, 186–188, who catalogues multiple Egyptian funerary spells offering the following protections: “Not to die for the second time”; “He who knows this spell does not die for the second time”; “Not to die for the second time in the realm of the dead.” Zandee even goes so far as to compare this phraseology to that found in Revelation 2:11; 20:6; 21:8. Further commentary can be found in Jan Assmann, Death and Salvation in Ancient Egypt, trans. David Lorton (Ithaca: Cornell University Press, 2001), 64–86. 16. Zandee, Death as an Enemy, 303–342, examines how earlier “pagan” Egyptian conceptions of hell and the afterlife may have influenced Coptic (Egyptian) Christianity. See further John Gee, “Some Neglected Aspects of Egypt’s Conversion to Christianity,” in Coptic Culture: Past, Present and Future, ed. Mariam Ayad (Stevenage, UK: The Coptic Orthodox Church Centre, 2012), 43–55. Blogger Clark Goble offers the intriguing idea that a large volcano near Jerusalem (Al Safa in modern Syria) might also have inspired Nephi’s metaphor of hell being a “lake of fire and brimstone.” Clark Goble, “Hell Part 2: Lake of Fire and Brimstone,” Times and Seasons (February 23, 2018). Alternatively, any of the known active volcanos in Mesoamerica may have provided the inspiration for Nephi’s imagery. 17. See also “Why Does Jacob Choose a ‘Monster’ as a Symbol for Death and Hell?” KnoWhy #34 (2016). 18. Another interesting parallel with the Book of Mormon is the ancient Egyptian belief that lurking in the underworld was an oppressive, abysmal darkness ready to consume the damned, who in one text are condemned as “those who do not see [the sun god] Re’s rays, and do not hear his words. They are in darkness, and their souls do not leave the earth, and their shades do not alight on their bodies.” Hornung, “Black Holes Viewed from Within,” 135, 137–138, 142, 150–153, quote at 138. 19. 1 Peter 3:18-20; D&C 128:15–18; 137:7–10; 138:25–37. 20. Largey, “Hell, Second Death, Lake of Fire and Brimstone, and Outer Darkness,” 88.